Topra 2G Premium Rollator With Free Backrest. This innovatively designed Topro Troja 2G Premium is practical and lightweight, it is the enhanced version of the original Topro Troja. The unique memory function sets the handles back to the correct position for the user when unfolding the rollator helping to promote excellent posture. Fitted with uniquely designed Topro ergo grip handles that aids the user when getting from a sitting to standing position, the handles provide a comfortable armrest and offer different holding positions when standing and resting. 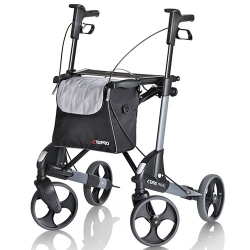 This rollator is fitted with comfort soft wheels ensuring maximum comfort and security levels are reached even when on rough terrain such as cobblestones and dirt roads. For ultimate safety, there are 6 reflector strips positioned around the rollator, ensuring high visibility. Easy to fold using the pull handle located on the seat the Topro Troja 2G is extremely compact and stands securely on its wheels when folded making it ideal for transportation and storage. Supplied with a smart shopping/storage bag with on main compartment and two inner zipped pockets. The bag mounts easily and securely onto the rollator and has both zipped and velcro fastenings keeping the users belongings safe. 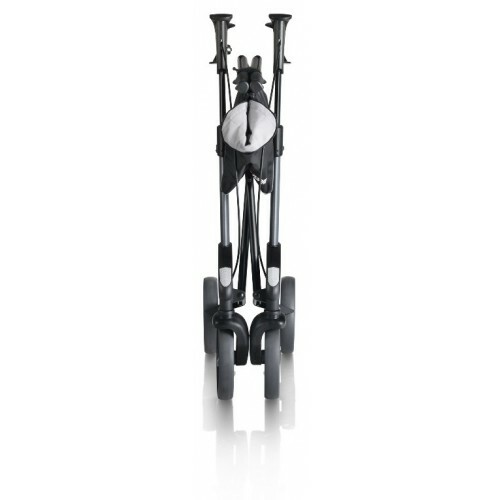 A really lightweight, easy to use rollator. looks nice and modern too which is always a bonus for mobility aids. Easy to fold and compact.